Cookie Galerie has about 7 outlets in Hong Kong. 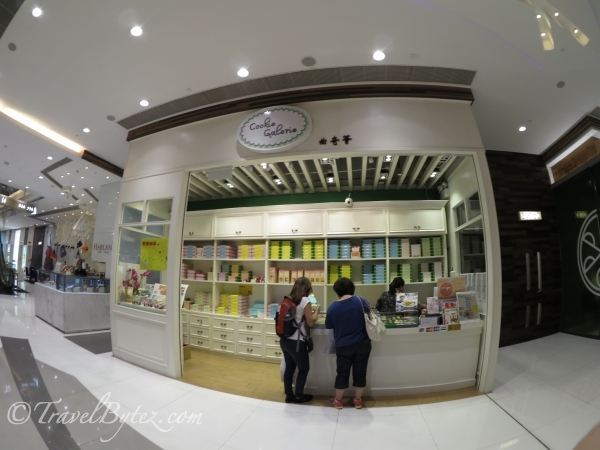 Prompted by C, we went to the flagship store in K11 Mall, Tsim Sha Tsui, Kowloon. It was not that hard to find and when we got there, we were the only customers at that time of the day. There were a wide variety of cookies on display with over 23 different types of flavor: Belgian Dark Chocolate 75% with sliced white almonds, Rose, Lavender, Green Tea, Pistachio and Blueberry and 16 different types of Palmiers including the Spicy Hot Pork Floss. There were also a variety chocolates, macarons and crispy cakes. The lady at the counter was really customer oriented and quite friendly (which was surprising) as she introduced us to the range of cookies available. 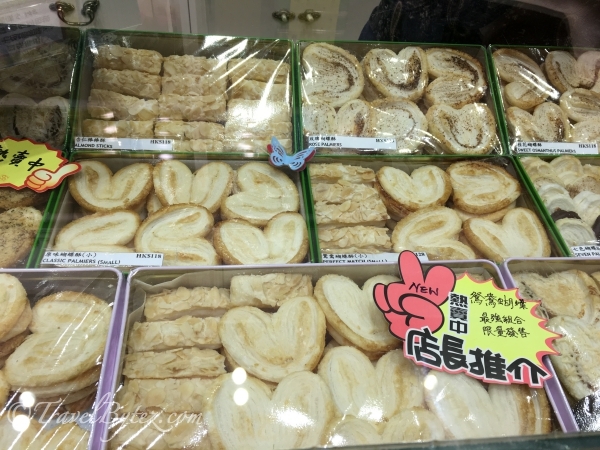 We tried the Green Tea, Coffee and Almond Crisps cookies, as well as a few flavors of Palmiers. Initially, C was the only one who wanted to go as she wanted to buy the cookies, we were supposed to be the entourage seeing her buy the cookies. However, after trying some of the samples, the rest of us ended up getting something as well. You can imagine the smile of the sales person that day when she had quadruple the sales. Well, the packaging was pretty and the samples were quite yummy, and do make for a nice little souvenir with the packaging and all. We walked away with bags of the original flavored Palmiers. They were delectably crisp and buttery, with just the right amount of sugar sprinkled on top (not too sweet). What gives it its unique taste is the apparent use of lard, if I remember correctly, but the momsie was not too impressed with them (taste can be such a subjective thing). Verdict: If you happen to be within the vicinity of an outlet, it would be nice to try some samples and buy the flavors that capture your taste-buds. On a side note, the K11 Mall has some pretty interesting shops.